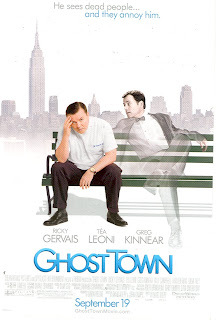 After dying during a routine medical procedure, Dr. Bertram Pincus discovers that he can see ghosts. This might be unnerving in and of itself, but the ghosts all want Dr. Pincus to do something for them. The most persistent ghost, Frank, wants to prevent the upcoming wedding of his widow. Dr. Pincus is a very nasty piece of work, rude to coworkers and patients, as well as inconsiderate to members of the general public. In order to avoid the non-stop parade of favor-requesting ghosts, he agrees to help Frank. Of course, in the meantime, he falls in love with the soon-to-be-married widow, played by a skeletal Tea Leoni. Dr. Pincus is portrayed, of course, by Ricky Gervais. I know he is the "flavor of the month" in comedy circles, but I honestly never "got" him. This movie doesn't do anything to help explain his appeal to me. First of all, he's supposed to be a "cosmetic dentist", but he himself has a mouth that looks like it's full of thumbtacks. That would hardly inspire confidence in prospective patients, would it? I was wondering at the beginning of the film why in the world his character had to be a dentist, but all was explained when he is called upon by the merry widow to provide dental expertise on a mummy. Aside from his prickly personality, he's somewhat, um, odd looking, so it isn't really believable that someone whom he had offended on a regular basis for years would suddenly fall in love with him. Call me the Grinch, but it doesn't make sense. Other than those gaping plot problems, the film itself is enjoyable enough. The audience was laughing hysterically at some points, although I didn't find the film as funny as they apparently did. It's a pleasant enough film, but I would hesitate to pay $8.75 to see it. Wait for the $1 movie showing, or rent the DVD.